It must be close to twenty years since I first read Dear Writer by Carmel Bird and I can honestly say I have never forgotten it. I bought three copies back then, but such was my enthusiasm for sharing what Carmel Bird was offering would-be writers, that I ended up with none. It being reissued as Dear Writer Revisited, gave me the opportunity to reread it and nothing has been lost. Its conversational, honest, and no nonsense tone, makes you sit up and listen to the lessons being so generously taught. 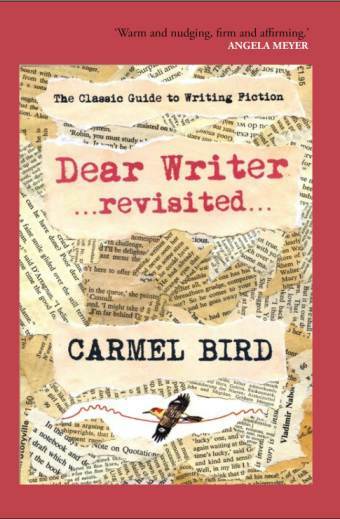 Dear Writer Revisited is described in its subtitle as ‘The Classic Guide to Writing Fiction’, and in one of the essays included at the end of the book, Bird tells us it is a piece of fiction about fiction. Each chapter is a letter to an novice writer providing advice from a manuscript assessor, Virginia O’Day; and to that extent it is fiction. The contents of the letters however, provide valuable information for would-be writers. Words of wisdom from Bird, and judiciously selected quotes from acclaimed authors, guide the reader/writer through many of the topics that need to be considered in order to write fiction worthy of being read. Too often students of writing are told to follow a set of rules, but rules are made to be broken; and although you could be forgiven for thinking, when reading the sub-title to each chapter, that Bird is simply applying conventional wisdom to her guide, she does more than that. She provides a context for each point she wishes to make and explains how to look more deeply into each issue. She presents examples where well respected writers break every rule to excellent effect, concluding that as long as it is done well, not following the formula is fine. The chapter I felt could have been dealt with more thoroughly was that on ‘choice of point of view’. Bird digresses from the topic by imploring the writer to make sure they get their facts correct if they want the reader to care about what they are writing. To be fair she does tie this in with the omniscient narrator needing to be credible, but an author checking their facts before allowing the omniscient narrator to relay them to the reader is a different thing. Apart from commenting on third person narrative, and first person narrative, Bird merely advises that we read the works of well-known writers and analyse what they do. Good advice, yes, but a few examples with some comment on the nuances of the points of view being used would have been more helpful. The minor variations in the ‘Revisited’ version, amount to no more than Bird’s introduction to the 2013 edition, and a smattering of Author’s Notes throughout the book. However, a major variation is the inclusion of two essays at the end of the book, each containing a story and an analysis of the same, through which Bird generously provides the reader with an insight into a writer’s mind at work. She comments that, ‘one doesn’t usually indulge in the flurry of analysis I have outlined here. I did it for you, Dear Reader, I did it for you.’ And I for one would like to say, thank you. Petrina Meldrum is a Tasmanian based writer with an MA in Creative Writing from the University of Tasmania. Her short stories for adults and children have appeared in a number of publications. She is presently working on her first novel. This entry was posted in Carmel Bird, Dear Writer Revisited, Issue 11, Petrina Meldrum, Spineless Wonder and tagged Australian Literature, Creative Writing, Fiction by Mark Roberts. Bookmark the permalink.